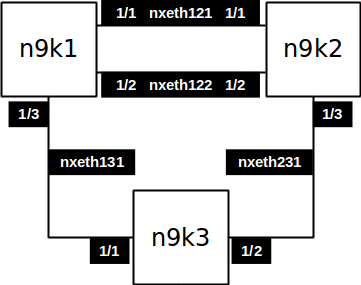 The Vagrantfile provided brings up 3 NXOSv machines with the connectivity you see above: each nxethXYZ adapter is a separate network inside of VirtualBox. Each switch also gets a unique base MAC address and its SSH and HTTPS ports exposed using unique ports on the host machine (check the Vagrantfile). These are the steps from the very beginning to download and brings this lab up. First, download and install Vagrant and Ansible. Then download the "Cisco Nexus 9000/3000 Virtual Switch for Vagrant" box from cisco.com. I've tested the process on these two versions: 7.0.3.I6.1 and 7.0.3.I7.2 (latest at time of writing). Peruse the release notes over a hot cup of tea if you're wondering what's new. Here we're following the steps from the DevNet documentation on how to provision one of these boxes. I've summarized the steps below for quick reference, but read the article the first time you do this, it has very helpful screenshots. There's also the NXOSv Documentation which may be useful later on. This step is entirely optional of course, as the switches are now up and running with a clean config (which you have saved in their flash if you ever need to reset the configuration). By running ansible-playbook provision.yml you get the correct hostname set on all 3 switches, nxapi and lldp enabled. Basics. If everything went according to plan (which is the point of using Vagrant and pre-packaged, predictable and repeatable builds), congrats, you have 3 NXOSv switches connected together ready for all sorts of adventures. Enjoy!